An interesting fern from Japan, Taiwan, China and nearby areas, Polypodium formosanum is easy to grow yet rather rare. 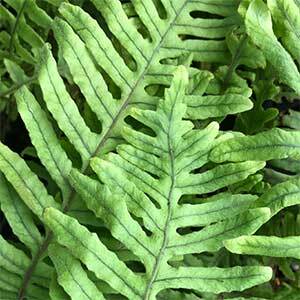 The fronds are a light green and this is a semi deciduous fern in cooler climates. Well suited to growing in a hanging baskets, as a ground cover in a Japanese style garden or perhaps in a vertical wall. This rhizomatous fern has an interesting blue green rhizome, which gives it another common name of ‘Blue Feet’. In hanging baskets us a potting mix that is rich with organic material. A position in shade to good filtered light is best, and keep the plant away from heating and air-conditioning outlets. Origins – Japan, Taiwan, China.